Fidelis Maximus vs The “Nutella Lawsuit”. | Fidel's Wandering Eye. Fidelis Maximus vs The “Nutella Lawsuit”. This is in response to an article a friend of mine pointed out to me yesterday in Yahoo! Finance which spoke of a lawsuit against Ferrero, the company that makes Nutella….my favorite chocolate treat of all time. * I think I can safely say that anyone who decides to sue Nutella because they thought it’d be good for them is an idiot. * The judge that didn’t throw this case and her out of court is an idiot too. * And everyone that had anything to do with taking this case to that court in the first place…? They’re idiots as well. * The fact that this lawsuit (and all lawsuits as idiotic as this one in years past) could even be possible in this country is baffling beyond words and in itself a large enough topic to be discussed at a later date. * The lawsuit also allows anyone who has bought Nutella in a certain two year span to jump aboard the ‘we didn’t know it was as fattening as we thought it’d be’ train and collect up to $20 as well. 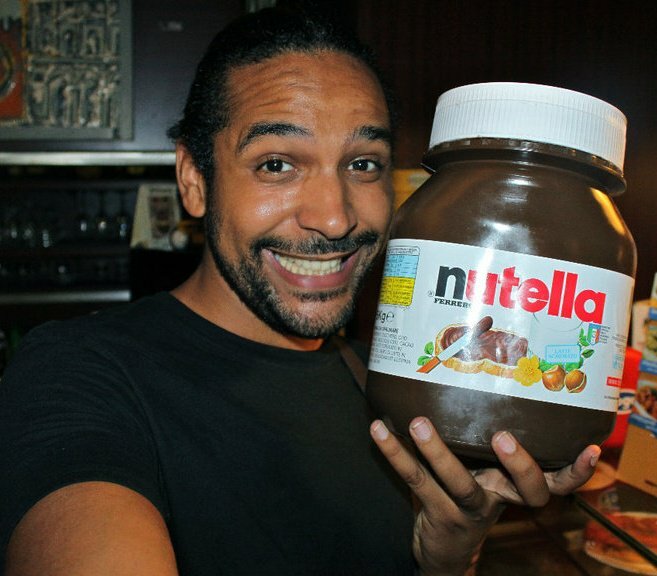 For the record, I don’t care if it said ‘the next time Nutella touches Fidel Amos’ lips he’ll die’ on every jar, I wouldn’t support a lawsuit against my beloved Nutella or its makers, Ferrero. Athena Hohenberg of San Diego, California seriously thought Nutella was going to be a good dietary choice for her 4-year old..? Actually, while we’re on that subject, why is her 4-year old on a diet in the first place..? Is she a heavy 4-year old? Perhaps the kind of heavy 4-year old that might be heavy in the first place because she eats everything that her mom places in front of her face..? Could it be that her mother has no idea what to feed her (proven, yes, by her mother’s own admittance of “dietary choice” selection) and that’s why she’s heavy in the first place, with or without the Nutella? People are stupid, and apparently getting more stupid every day. I hate people.